New distance PR!! 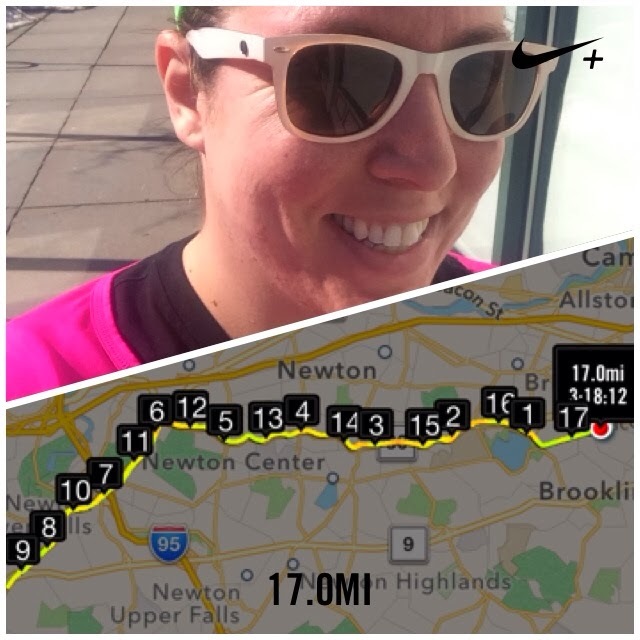 17 miles!! You’re going to have to bear with my celebrations the next few weekends, as well. Will be hitting 18 then 19 miles. 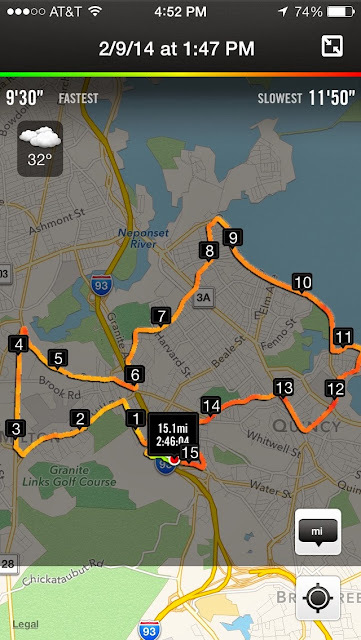 So yesterday I went out on the course, running Brookline to Wellesley and tackling the Heartbreak Hill area in Newton. I got going around 8 am and even though by the end of the run, dare I say I was hot!, the morning was all about ice skating. I honestly have no idea how I didn’t fall. Everywhere was black ice and I wasn’t the only one struggling. The slick conditions definitely put a damper on my pace early on, but by the time of my turn around the ground felt a lot better and, to my surprise, so did my body! If you recall, I was having a hard time with 15 miles a few weeks ago. I’m happy to report that these 17 miles did not bring with them the same awful feelings mid run. (I didn’t once contemplate calling a cab!) Despite the morning ice, overall the route was much easier than a few weekends ago. It also really helped being on the course with so many others also out for their long training runs. Lastly, I made a pointed effort to pay attention to my mid run intake and kept to the “one Gu every 45 minutes” rule. Oh yeah. I also got a high five by a man in a gorilla suit. Now that I think of it, I’m sure that was what made all the difference. This has been a crazy week! I had intentions of doing a post earlier in the week and then the days have just slipped by. So here it comes, all at once, in one fabulous posting! Tuesday Dr. Carter, one of the psychologists at Spaulding and a marathon runner himself, gave us a talk entitled “It’s All in Your Head.” This was a very welcomed topic coming off my recent distance PR of 15 miles, at least 3 miles of which I contemplated calling a cab to pick me up mid run. Essentially we covered some of the mind games of running and strategies to overcome that dreaded “wall.” I’m looking forward to trying out some of the techniques. I think a big one for me will be positive framing – “wow, I just ran 10 miles!” Instead of “ugh so many more miles to go…” I also think refocusing thinking is going to be important. As my mileage increases, while I respect the need to be in tune with your body, I am finding myself beginning to focus on fatiguing muscles that really aren’t a concern they’re just, understandably, tired. My continued thinking about that tired feeling makes the sensation even worse. I am going to try and redirect mental energy in other ways. I’ll have to figure out what works for me, as many of my teammates run with music but that’s really not my preference. I’ll keep you all updated on what I work out. I’m thinking I just end up telling myself weird stories. One perk of growing up an only child, I can generally find ways to entertain myself, even in my head. Ha! Going in to this weekend’s long run I actually wasn’t expecting I’d have to pull much from this lecture. Only needing to run 13 miles this long run was a small “fall back” compared to last weekend. Then the snow had a different plan. I heeded my parents’ advice (or was it an order?) to not run on slippery unshoveled sidewalks or down the center of busy roads. That really left me few options and to the Y I went, mentally preparing myself for my treadmill distance PR. I will very cautiously say that it was not as bad as I expected. Mind you, it still kind of sucked (especially miles 10-13) but I got through it and am happy I did. I don’t want to start falling into an excuse pattern because this cause, this process and this accomplishment just means too much to me. Distraction was easy since I watched a few episodes of “Project Runway: Under the Gunn.” I know, there are athletic feats of indescribable proportions going on with the Olympics, but what can I say? I’m motivated by caddy fashion designer banter. The next few long runs have me going 17, 18 and then 19 miles, so I am really REALLY hoping Mother Nature cooperates and I can enjoy the outdoors for those distances. It feels kind of cool, in a weird way, to have tackled the treadmill like this but I will take hitting the road and the fresh air over a run to nowhere any day! My last little diddy is about my awesome day yesterday on the mountain. 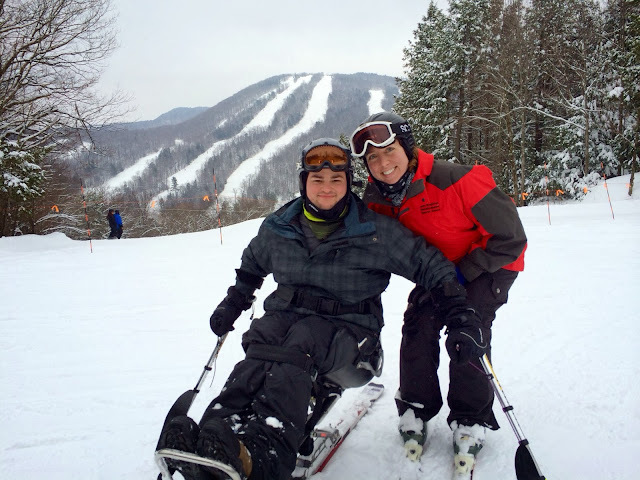 Training for the marathon has significantly limited the times I can get up to my ski program, the New England Handicapped Sports Association (NEHSA), to teach on the weekends. I was so happy to finally be able to head up yesterday and much to my excitement a patient I had worked with in the summer was who I would be skiing with all day! This was Jeff’s third time on the mountain and he was skiing the mono ski like he had been out way more often than that. It was such a privilege for me to spend the day with him and to see and hear how far he had come since being in Spaulding. While I believe Jeff’s successes since his injury are all accounted to his hard work, motivation and self-determination, it still made me really proud to spend time with him outside the hospital and feel that at least in some small way Spaulidng helped set him on this awesome path. The people I get to meet through my work inspire me every day and I, once again, was able to reflect on how honored I am to be running the Boston Marathon for Spaulding Rehabilitation Hospital. This is the part of training that’s kind of cool. 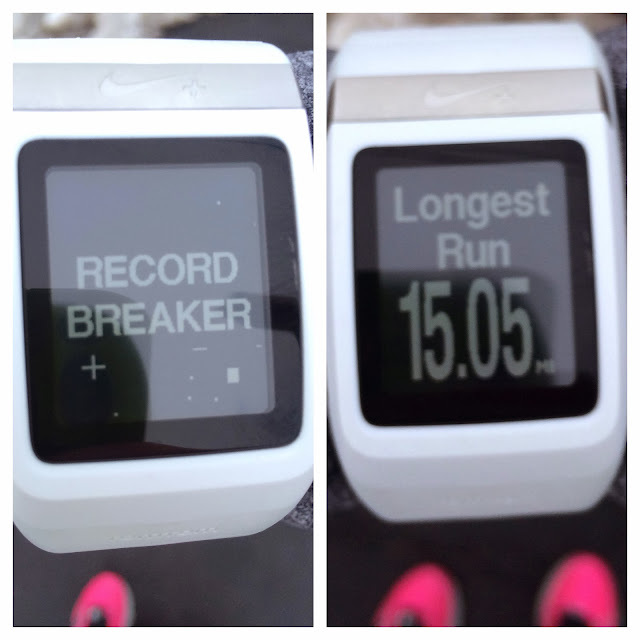 Being my first marsthon, long runs are turning into distance PRs! That definitely helps me with motivation, as I get competitive with myself. Not gonna lie, though. Today’s miles were a bit tough. I don’t know if it was the cold. The new fuel belt, though I got it adjusted and comfy by 0.5 miles. 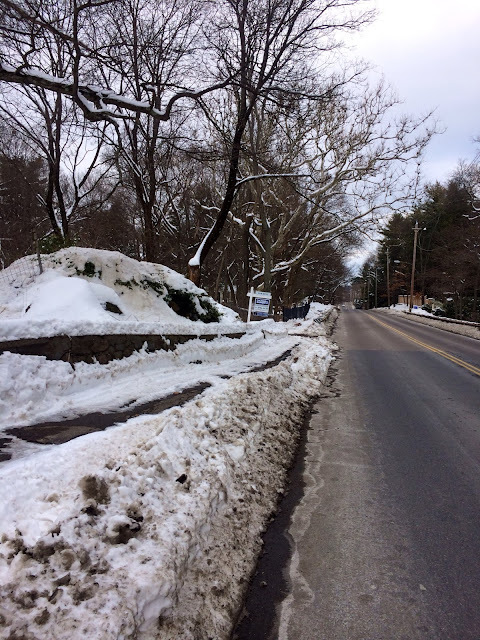 Maybe it was the roads and sidewalks, which literally were not even remotely cleared for about 90% of my route. This picture doesn’t even show the worst areas I went through. Definitely made it tough, trying to find a clear-ish route where I wouldn’t slip and fall or get hit by a car. The worst was by the water where I guess no one takes on clearing the sidewalks over there. I am actually a little surprised I wasn’t hit by a car over there. The turkeys crossing didn’t add agony to my run. 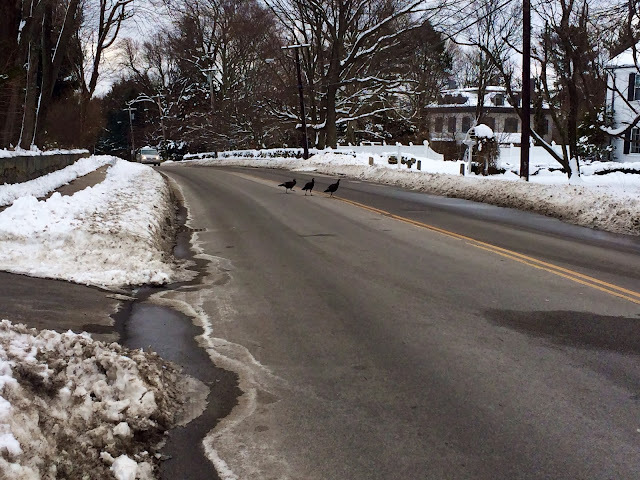 Wild turkeys like me (you can ask my best friend, Lesley, about a story from my driver’s ed oh so many years ago!) and they were kind of cute. I lost my mittens at about 4.5 miles, which was a wicked bummer. I started out wearing them but it wasn’t too bad out weather wise and I tried to latch them on to my new belt. Fail. But ultimately that didn’t make my run tough. In truth, it was probably a combination of everything paired with this being my longest distance to date and the need to just mentally push through. I felt great getting out there and then around mile 9.5 it wasn’t necessarily negative talk, but almost more like some self doubt creeping in. Really when I started out today I was like, “Man this run is so great! 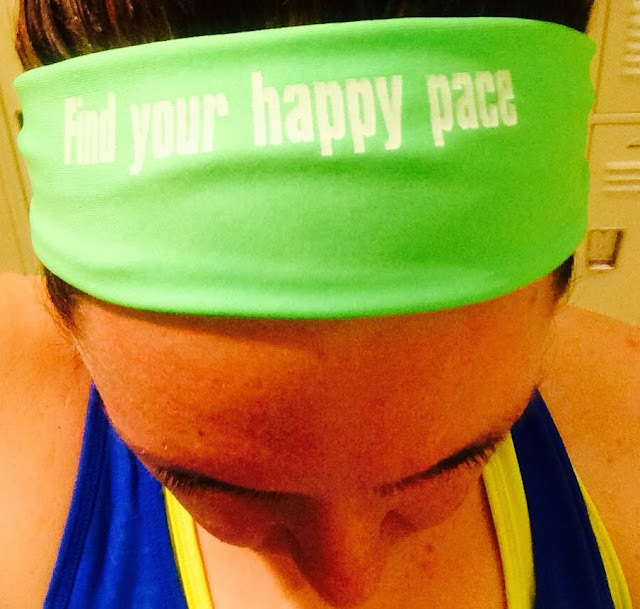 Blog title ’15 miles and feeling fine! '” Definitely didn’t feel I could use that when I finally got back to home. I’m happy I was able to push through, but really I was feeling close to not being able to. I’ll be curious to see how my next few long runs go and if I seem to hit a similar mental road block. Tuesday I’m going to our team psychologist’s lecture “It’s All in Your Head” and the timing could not be better. 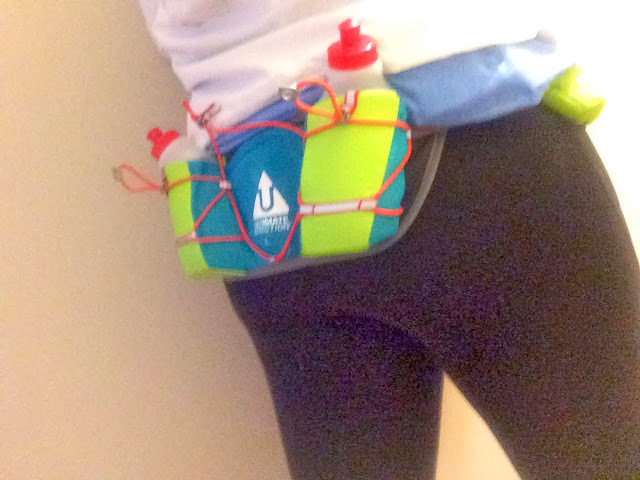 I did add fueling and water to my run today (though admittedly I have no real sense of if that helped or not, just know it’s a necessity at this point) but now I think getting some tips and tricks to keep myself mentally in check for the longer miles is going to be really helpful. I’m still enjoying this process a lot. And part of a challenge is experiencing the highs and pushing through the lows, so I’m not going to get down because of this one run. To lighten things up a bit, I’ll once again invite you into my bizarre running brain. For over an hour I was singing “The Monster” by Eminem but I literally know none of the words so it turned into something like “I’m friends with a monster, it’s under your bed. I really like monsters, they’re all in your head. You try to save me, but I like them so bad. And you think I’m crazy, you think I’m crazy.” It went even more downhill from there. Also, when I was on sea street I literally could not stop thinking “sea lions on sea street. Sea lions on sea street!” I don’t ask questions anymore, I just go with it.